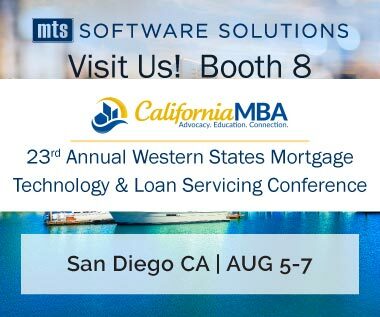 Join the MTS Software Solutions team at The Hilton San Diego Bayfront for the 23rd Annual Western States Mortgage Technology and Loan Servicing Conference. This annual conference is is California MBA's signature annual event for residential mortgage professionals in the technology and loan servicing sectors. Attend to connect with leading mortgage technology experts and vendors, strategize for the future and learn about the latest technologies to help you grow your business. MTS Software Solutions invites you to stop by Booth #8 to learn more about automation technology for the mortgage industry and how we're helping lenders to turn more loans in less time with fewer resources. MTS provides technology and services that simplify, streamline, and accelerate document and data-driven processes. MTS' flagship product, IntellaLend, empowers the mortgage industry to digitally transform the loan life-cycle by automating internal quality control standards throughout Pre-Funding, Post-Closing QC, Servicing, Warehouse, and Wholesale lending. Our IntellaLend solution automates loan set-up and integrates with your Loan Origination System to streamline delivery of loan documents and data. This allows you to make credit decisions, close loans, and maintain compliance more efficiently. Look for our booth #8 and stop by to try your luck to win a prize!